Pacific Islanders’ lives were transformed by the First World War. Returning servicemen had seen the world and been exposed to new experiences and new cultures. Within the New Zealand Expeditionary Force (NZEF), they had been treated fairly and as equals. This created expectations that were not always fulfilled after they went home. For the New Zealand authorities, the immediate concern was to repatriate these men to their island homes. The main focus was on Niue and the Cook Islands, which had been annexed to New Zealand in 1901. Contingents had been enlisted in both Niue and the Cook Islands and brought to New Zealand by the army authorities to provide reinforcements for the part-Māori Pioneer Battalion. Guidelines for their return were established, and generally followed. But two major factors – lack of shipping and the influenza pandemic – meant that arrangements did not always go according to plan. Soldiers from other Pacific islands were also in the NZEF. Contingents from the British Crown colonies of Fiji and the Gilbert and Ellice Islands who were training in New Zealand when the Armistice was signed were returned home by the New Zealand authorities. Individual men from Tonga, Samoa, Tahiti, Fiji and the Gilbert and Ellice Islands had also enlisted for service in New Zealand, and some had served overseas. (There was no recruitment of native Samoans in German Samoa, which remained an enemy territory under New Zealand military occupation until after the war.) Their repatriation costs were dealt with on a case by case basis. In the Cooks and Niue, other postwar issues were the payment of allowances and gratuities, and eligibility for war pensions. In the 1920s war medals were distributed and the question of war graves in the islands was decided. 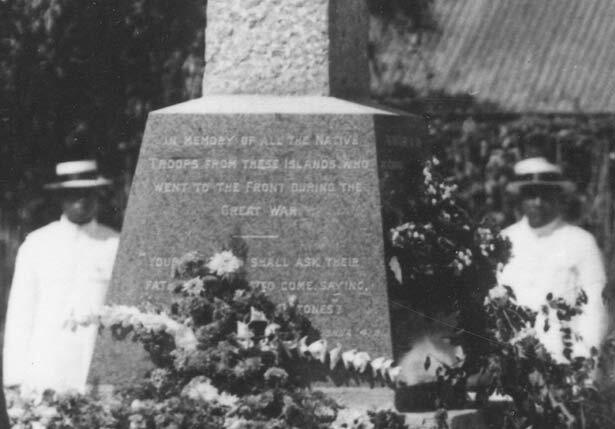 The Pacific Islands’ war effort was acknowledged through official visits by government ministers and the Governor-General, the gifting of captured German guns, and the construction of memorials and boards of honour. More difficult to resolve were the lack of employment opportunities for the returning soldiers and their readjustment to societies that were closely controlled by the church and the colonial administration. Reality often did not match expectations. Some men left home again in search of work and better opportunities. Others made the adjustment and went on to assume leading positions within island societies. We have 19 biographies, 40 articles, related to Pacific aftermath.